The University of Texas at Austin is kicking the smoking habit, announcing today that it will ban smoking on all university grounds. The new policy is meant to ensure that UT continues receiving cancer research funds. The University of Texas at Austin announced today that it will ban smoking on all campus grounds. “This is an institution of higher education, so it’s logical that we emphasize education, awareness and a spirit of cooperation in enforcing the policy,” Pat Clubb, vice president of university operations, said in a press release. The university was already headed toward a complete smoking ban, but that plan was accelerated after the Cancer Prevention and Research Institute of Texas announced in February that it would tie future research funds to tobacco-free policies. UT gets about $30 million each year now from CPRIT and could apply for as much as $80 million. The university created temporary smoking areas for the first year of the ban and is offering quit support to those who would like to stop smoking. Despite polls showing overwhelming public support and endorsements from celebrities like Lance Armstrong, efforts to establish a statewide workplace smoking ban have fallen flat in recent sessions of the Texas Legislature. But a state agency is finding that the billions of dollars it has at its disposal may allow it to be more effective in getting comprehensive tobacco-free policies established — most notably, at university campuses. University administrators on campuses around the state are mulling campus-wide tobacco-free policies as a result of new rules established by the Cancer Research Prevention Institute of Texas. In January, the institute’s oversight committee adopted a policy that requires grant recipients to have policies prohibiting tobacco use in buildings and structures where financed research activities are occurring, as well as at the outdoor areas immediately adjacent to those buildings. The grant recipients must also provide smoking cessation services for community members who desire them. For schools that pride themselves on their research function, like the University of Texas at Austin — which has received about $30 million in grants from the institute and is hoping for $88 million more from new requests — there is a clear financial incentive to institute changes. “If folks have to go a little bit farther, if they have to think about having a cigarette a little bit more, we are encouraging them to smoke less — which results in positive benefits — or to quit all together,” said Bill Gimson, the executive director of the institute. He added that the new rule is not a response to legislative failures but is simply consistent with the institute’s mandate to prevent cancer in Texas. In 2007, the research institute was established with the passage of a constitutional amendment that easily won voter approval. The state was authorized to issue $3 billion in bonds over 10 years to finance cancer research and prevention efforts. Nearly $600 million in grants have been issued, primarily to academic institutions. Institutions currently receiving grants must be in compliance by Aug. 31 or their current financing could be in jeopardy. The policy will apply to all new grant proposals submitted on March 1 or later. Around the state, institutions are scrambling to revisit their tobacco policies. Adrienne Howarth-Moore, the director of human resource services at UT, said that narrowing down the buildings that current and future research might occur in — or revisiting the issue each semester as the affected locations change — could prove challenging. The existing policy prohibits smoking in all buildings, as well as within 20 feet of doors and windows. Howarth-Moore said expanding the capacity of the university’s current cessation services, as well as producing additional signage and educational materials, would probably have an economic impact, though she said the amount is unknown. 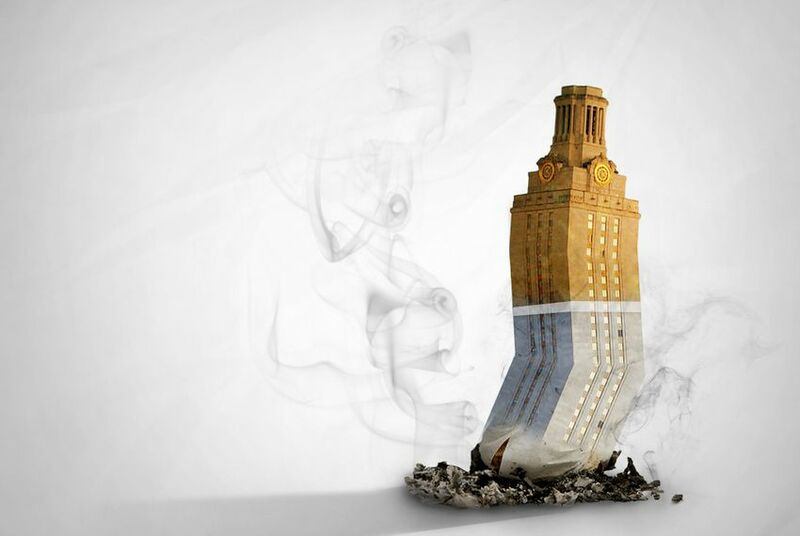 In early 2011, UT’s student government called for a campus-wide tobacco ban. Bill Powers, the university’s president, had openly opposed it, claiming that it would infringe on personal freedom. Gimson shrugged off the notion of overstepping, saying that campuses still have choices. While Gimson said the rule change is intended to be a carrot and not a stick, it is a large one that many universities cannot afford to ignore. “I don’t know what we want to call it,” said Taylor Eighmy, the vice president for research at Texas Tech University, which has received nearly $1 million in grants. “It’s not legislation, it’s not a mandate, it’s not a federal or state requirement. And with research financing at stake, the president of UT is coming around. “President Powers supports revisiting these rules in light of the recent decision by CPRIT,” said Gary Susswein, a university spokesman. Although the prospect of having to leave the campus to have a cigarette is certain to create some anger on college campuses, a number of tobacco users welcome the change. A campus-wide ban is not a sure thing. As compliance deadlines approach, UT administrators say such a policy remains one of many options under consideration. At the University of Houston, which has received nearly $7 million in grants from the cancer research institute, the student government recently approved a resolution to extend a prohibition on smoking within 15 feet of facilities to 25 feet. “This is a topic of interest and importance to the university, even before we learned of the new guidelines,” said Richard Bonnin, a university spokesman. He indicated that UH was also considering a campus-wide measure. “It’s still early in the process, and we want to make sure everyone’s viewpoints are expressed before making a final decision,” he said. Jason Cook, a spokesman for Texas A&M University in College Station, which has received more than $3.4 million in grants, said the issue would be complicated on A&M’s 5,000-plus-acre campus, which contains more than 500 buildings and multiple state agencies. “Given the issue of size and scope and the multiple organizations on our campus, we intend to have a very engaged discussion,” he said, adding that the first step would probably be to establish boundaries around buildings where institute-financed research is currently occurring. A handful of institutions in Texas, including the University of Texas System campuses in Arlington and Brownsville, have already adopted campus-wide tobacco bans of their own accord. At UT-Arlington, which has received nearly $2.3 million in grants, the policy was phased in over nearly two years. Kristin Sullivan, a university spokeswoman, said the economic impact had been nominal — approximately $7,000 per year. Gimson said he sees progress in the movement toward anti-tobacco policies on university campuses.